Switzerland's Roger Federer and Uzbekistan's Denis Istomin greet each other after the match. Ageless Roger Federer warmed up for a run at a record seventh Australian Open title Monday by breezing past Uzbek Denis Istomin to book a spot in the second round. The 37-year-old Swiss master made light of his assignment on Rod Laver Arena, wrapping up the match 6-3, 6-4, 6-4 as he confidently began his title defence. "I'm very happy with my first round, to be honest," he said. "It's been great. I felt the ball really good." Federer has won the last two tournaments at Melbourne Park in a late career resurgence and is now angling for a 21st major victory. His achievements so far put him on a par with other six-time winners Novak Djokovic and Roy Emerson -- although the Australian great's victories all came before the Open era. "It's disbelief really that I'm the double defending champion at my age," he said, adding that it was a "fairytale challenge" to be going for another one. "I'm going to try everything possible (to win again) and leave it all on the court. I will give it everything I've got." Federer led from the outset, saying it allowed him to swing freely, particularly since his serve had clicked straight into place at the season-opening Grand Slam. "When you trust your second serve, you can go after your first serve," he said. "I think I can be happy how I got out of the blocks from the off-season. "That's always the most tricky part, because if you don't get broken much, or hardly ever, not at all... you can really try out different things." Federer came into the tournament in a buoyant mood after teaming with fellow Swiss Belinda Bencic to win a second succesive mixed teams Hopman Cup title in Perth this month. "I served and volleyed in the mixed doubles all the time and spent a lot of time at net," he said. "I've been feeling good at net for quite some time now." 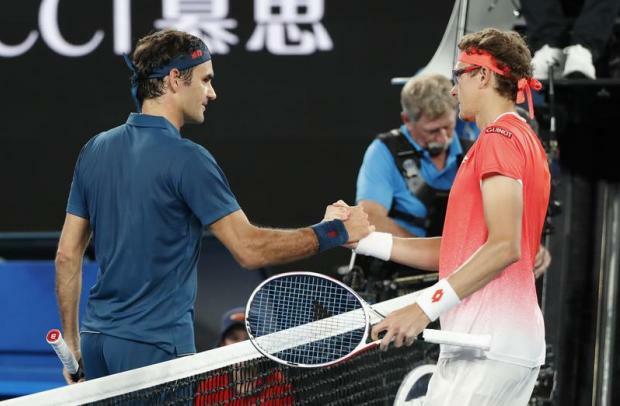 Istomin caused a massive upset in Melbourne two years ago when he knocked out defending champion Novak Djokovic in the second round, but was no match for the Swiss great. The writing was on the wall with Federer winning all six of their previous meetings. "It was great to be back here, I was brought some good energy and played some good shots," said third seed Federer. The world number three next plays Britain's Daniel Evans, who battled past Japan's Tatsuma Ito in three sets.